The 2018 college football season has officially begun. As Pro Football Focus enters its fifth season of collecting data and grading every player on every play of every game at the FBS level, we will use mathematical modeling and machine learning to make some ‘against-the-spread’ and over/under picks for the season. These models rely heavily on our PFF ELO rating system for college football, but also include situational information, along with opponent-adjusted information on things like passing when kept clean. For the first (real) week of college football, we’re all over home (and neutral site) underdogs, with Washington, Western Michigan and Florida International our spread picks for the week. Our one total is a late-night affair on Friday night, with San Diego State putting up enough of a fight against Stanford for that game to get into the 50s. Our new PFF ELO system really likes Notre Dame relative to Michigan, and our spread pick reflects such a thing in this premier matchup. Like our NFL picks, which went 49-37-5 (57.0 percent) in 2017, we plan to present five picks a week, which will be printed on Wednesday of each week (after this initial week). Our analysis will involve a point-counterpoint breakdown between the two of us, using perspectives that only the PFF grades and data can provide. For more picks-related opinions, follow us on Twitter at @BrownBenjamin22 and @PFF_EricEager. 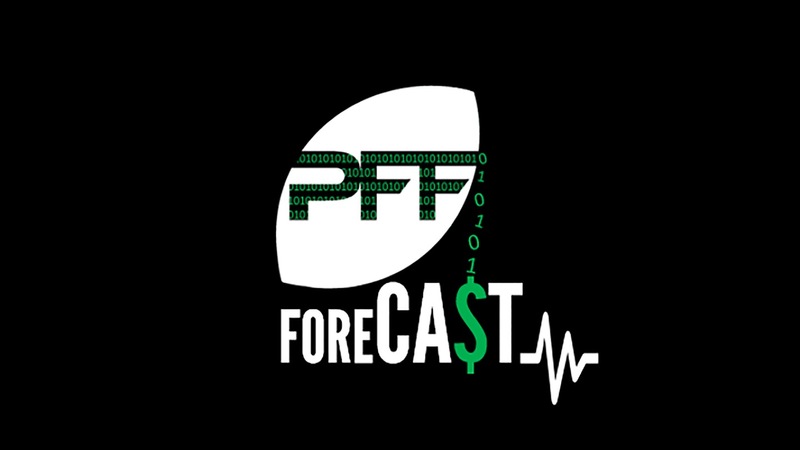 For some podcast commentary on some of these picks and the process that goes into them, give the PFF Forecast a listen. All lines available through our sponsor, MyBookie.ag. Point (Ben Brown): A healthy Jon Wassink returns after posting a 110.3 passer rating when kept clean in 2017. With him out of the lineup, the Broncos stumbled down the stretch, finishing 1-3 with Reece Goddard running the offense. To start 2018, our model has Western Michigan approximately 80 PFF ELO points better than Syracuse. This should play as a close shootout and as a home dog to start the season, we have this game playing as close to a pick em then the actual +4.5 spread. Take the points. Counterpoint (Eric Eager): My reservation here, which will be different than the pick below, is, in many ways, the number. At 4.5, there’s always the chance of a hard-fought game that ends within a touchdown and fails to get you to the window. 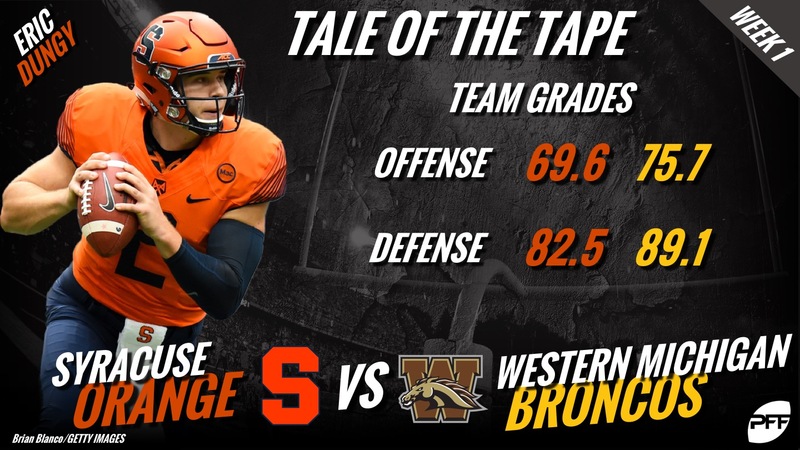 Additionally, Syracuse returns Eric Dungey — a dual-threat quarterback who graded well as both a passer and a runner a season ago. His receivers let him down, grading out as one of the worst units in the country. We know that supporting casts regress faster than quarterback play, so look for the Orange to make this pick interesting. Point (Ben): Stanford enters 2018 as our 10th-highest rated offensive unit according to our PFF ELO offensive rating. Quarterback K.J. Costello returns after posting an average depth of target (aDOT) of 10.42 in 2017. We anticipate him looking to move the ball downfield in chunks after 18.5 percent of his attempts traveled 20 yards or more downfield last season, and he was incredibly efficient on these attempts posting a 113.0 passer rating. Christian Chapman posted a 9.36 aDOT, so the hope is that we see some big plays early to pull these teams out of their slow pace. 48.5 is an incredibly short number in college football and our model has the over pegged as one of our favorite plays in Week 1. Counterpoint (Eric): Pace might be an issue for this one, as Stanford had the fifth-fewest offensive snaps a game a season ago. San Diego State isn’t much faster, rating 110th in the country themselves. 48.5 is certainly a short number for college football, so our intercept is going to lean towards the over for most games like this. We better hope that the diminutive Juwan Washington (who averaged 6.0 per carry and 2.6 after contact per carry last year) and Co. can replace Rashaad Penny in complementing Chapman, who had a 104.0 passer rating when clean last year. Point (Eric): This is very much a model pick, with the over hitting less than 40 percent of the time according to our fundamentals. We currently have USC as a top-10 team, despite losing Sam Darnold and other offensive weapons a season ago. While I think it might take a few weeks for our model to truly appreciate the shakeup in Southern Cal, they will likely control this early-season game, and do so with their defense. UNLV quarterback Armani Rogers did most of his damage a season ago as a runner, with all of his good passing performances happening before Week 6. Look for he and prized freshman J.T. Daniels to feel their way into a game in the 50s in this one. Counterpoint (Ben): This total has picked up a bit of steam after initially opening at 60. It’s settled in with most books posting between 63.5 to 64. The truth is oddsmakers appear to be extremely indecisive finding the appropriate total as some prints of 64.5 to 65.5 occurred after true freshman Daniels was officially named the starter. 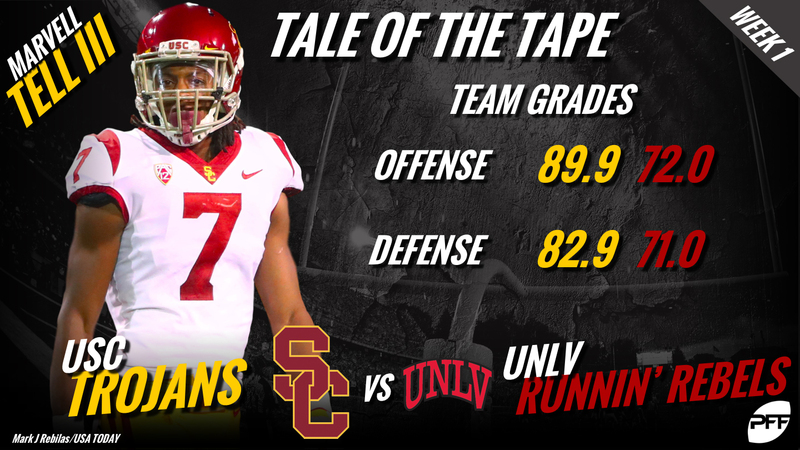 How this new-look Trojan offense looks will definitely determine if this game stays under. In 2017, USC played at one of the quickest paces in the country averaging close to 80 offensive snaps per game. If this stays tight, the urgency in the fourth quarter could push this game to the higher limits of the over and prove prognosticators correct who pushed this total upwards. Point (Ben): Jake Browning returns to lead a Washington Huskies team with national title hopes. In 2017, 5.4 percent of his attempts were big-time throws, had a 117.5 passer rating when kept clean and should be in all Heisman Trophy discussions to start the season. His supporting cast is the real question mark, and he will rely heavily on Chico McClatcher’s big-play potential. Listing this as a neutral site game is definitely gracious to Washington, as it is being played a little under two hours from Auburn. If labeled as a home game for Auburn, our model likes Auburn but the points are too enticing to ignore. Facing a revamped Auburn secondary, we like Browning to deliver in this big early season matchup. Counterpoint (Eric): While Washington is certainly tough defensively, especially where it matters most, stopping the run in coverage, Auburn has a quarterback in Jarrett Stidham that tied for the second-lowest percentage of turnover-worthy throws in the SEC a season ago. He was 11th in the country with his 113.9 passer rating on passes traveling more than 20 yards in the air, meaning there is some upside for the favored Tigers where it matters most offensively. On the other side of the ball, Auburn was no slouch in pass coverage last year (eighth in our grading). It will remain to be seen how well they can replace the likes of Carlton Davis, however, and the proof will be in the pudding Saturday. Point (Eric): This is very much a model pick, as we have Notre Dame higher in our inaugural PFF ELO college ratings. We would favor Notre Dame even on a neutral field, choosing to buy into Brandon Wimbush’s first eight games, where he graded average or (often well) above average in seven, rather than his shaky performance down the stretch. Additionally, our friends at 247Sports like Notre Dame’s incoming class better than Michigan’s class, a model fundamental we’ve found that moves the needle in a nontrivial way. Counterpoint (Ben): Michigan returns what many believe to be the deepest and most talented secondary in the FBS. As a coverage unit in 2017, they contested 23.3 percent of attempts (seventh in the nation). When you can cover at an elite level, it makes up for significant shortcomings in other facets of the game. Shea Patterson appears to be a significant upgrade over the quarterbacks Michigan used in 2017. His 105.3 passer rating when kept clean at Ole Miss has Big Blue faithful optimistic. With Michigan starting off as a 1-point favorite and now moving to pick ’em (or even -1 ND in some spots), its possible this line has moved too much in Notre Dame’s favor for a game that could come down to who has the ball last.